The application icons you see on the Home screen don’t represent all the apps in your Galaxy Tab. Those icons aren’t even applications themselves; they’re shortcuts. 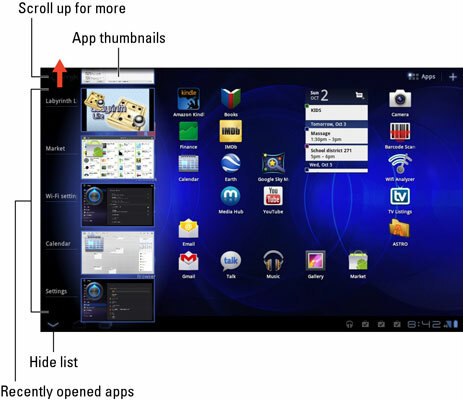 To see all applications installed on your Galaxy Tab, you must visit the Apps Menu screen. To do so, touch the Apps button on the Home screen. You see the first panel of the Apps Menu. You can find any additional apps by swiping the Apps Menu screen to the left. As you install apps, they’re added to the Apps Menu. New apps are inserted into the Apps Menu alphabetically, which means that any time you add an app the Apps Menu gets re-sorted. That makes it difficult to locate apps by memory, so you may want to place apps you use most often on the Home screen. 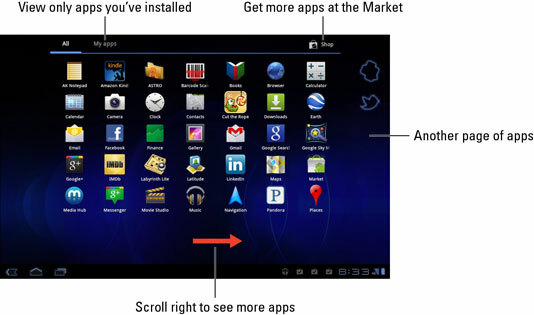 To view only apps you’ve installed on your Galaxy Tab, touch My Apps at the top of the Apps Menu screen. You probably use the same apps over and over on your Galaxy Tab. You can easily access that list of recent apps by touching the Recent Apps icon button on the Home screen. When you do, you see a pop-up list of apps most recently accessed. To reopen an app, choose it from the list. Otherwise you can hide the recently used apps list by touching the Back (or Back-Hide) icon button. For the programs you use all the time, consider creating shortcuts on the Home screen.